ABOARD USS ABRAHAM LINCOLN, IN THE ATLANTIC – The Navy’s F-35C Lightning II Joint Strike Fighter has been incorporated into a carrier air wing’s cyclic flight operations for the first time alongside aircraft from Carrier Air Wing 7. 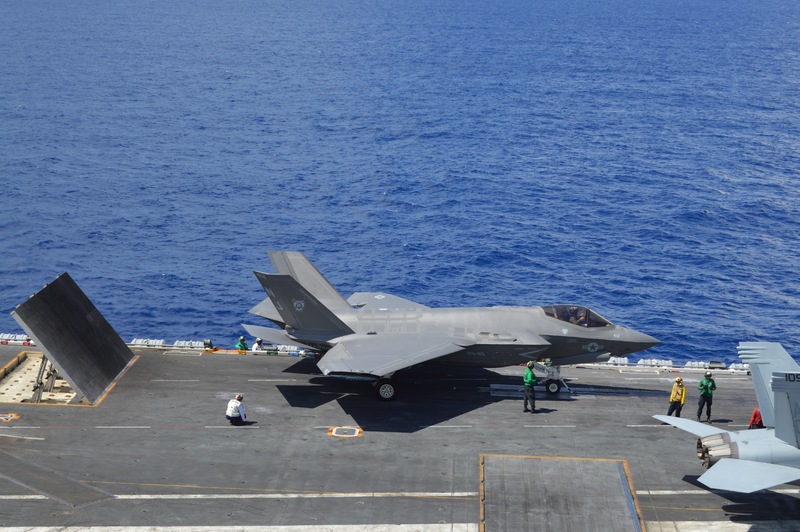 Since the JSF naval variant conducted its first takeoff and landing on a carrier in 2014, the plane has done extensive testing ashore and at sea. But never has the fighter been normalized in this way, with the ship’s flight deck crew treating it the same as any other aircraft onboard. 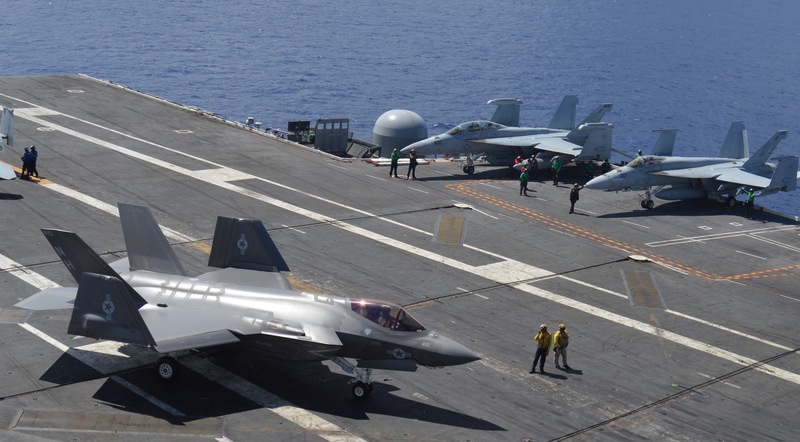 For the first time, F-35Cs launched, recovered and maneuvered around the flight deck alongside F/A-18E/F Super Hornet, EA-18G Growlers and E-2D Advanced Hawkeyes. 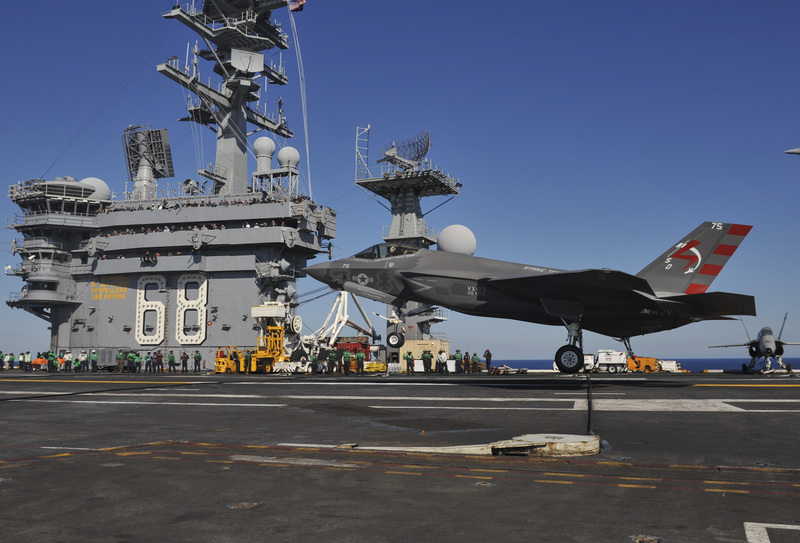 Previous periods at sea had the F-35Cs operate by themselves in controlled test settings. 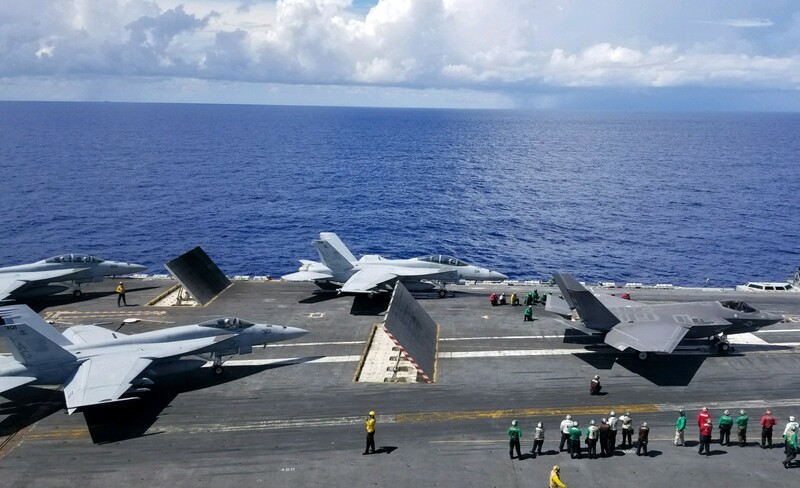 USNI News was among several media outlets invited to observe these integrated air wing operations aboard USS Abraham Lincoln (CVN-72), in the Atlantic Ocean. The Navy had previously set an objective date for reaching initial operational capability (IOC) in August 2018, which the service will not meet. The threshold objective – the minimum requirement, compared to the ideal objective date – is February 2019, and Horan said he thinks the service can still meet that timeline. Ahead of that declaration, the fighters will have to conduct a formal initial operational test and evaluation event at sea, compared to the ongoing Operational Test-I event that does not count towards IOT&E. That evaluation should take place this fall. Additionally, Horan said, a squadron will have to be manned, trained and equipped to operate 10 aircraft at sea; an adequate logistics chain will have to be in place; at least one aircraft carrier will have to be modified, equipped, trained and certified to operate the F-35Cs; and other items. “Most of those things are coming together, and the main thing really left is to demonstrate operational capability, the capability of the 3F (software) configuration in an operational test,” Horan said, referring to the 3F software variant the Navy is now using. As for the carrier modifications, Lincoln underwent a mid-life refueling and complex overhaul (RCOH) that wrapped up last summer. During that four-year maintenance availability, the ship was outfitted with everything it needs to operate F-35s and was therefore chosen to conduct F-35C operational test and evaluation events. According to current Navy planes, USS Carl Vinson (CVN-70) will conduct the first F-35C carrier deployment in 2021. Capt. Putnam Browne, commanding officer of Lincoln, said this current at-sea period is also his ship’s first time conducting air wing operations since coming out of four-year period. Carrier Air Wing 7 had been aboard for three weeks conducting cyclic flight operations, and on the weekend of Aug. 18 one Super Hornet squadron left the ship to make room for the six F-35Cs. In replacing a Super Hornet squadron with a Joint Strike Fighter squadron, Lincoln was “replicating what the air wing will look like in the future,” he said. Horan told USNI News aboard the ship that, in terms of what questions he had going into this first operational test and what he was paying closest attention to. “Each airplane has its own idiosyncrasies around the aircraft, particularly towing it, moving it around. And until you get an airplane out and mixed with other airplanes, you don’t necessarily grasp those differences. And that’s what we’re doing out here now,” he said. F-35Cs began arriving at Naval Air Station Patuxent River in 2011 for testing, and by November that year a JSF had conducted its first ground-based catapult launch from Pax River to prove a key component of being a carrier-based jet. In 2012, the final test jets had arrived at Pax River; a carrier-landing assistance tool began ground-based testing, and the first external weapons test flight took place. In 2013 the first F-35Cs were delivered to a squadron – in this case, Strike Fighter Squadron (VFA) 101, the Navy’s F-35C fleet replacement squadron at Eglin Air Force Base, Fla. In September 2017 USS Carl Vinson (CVN-70) conducted its first F-35C at-sea operations, and in December Lincoln hosted carrier qualifications for the Navy’s first nine pilots who will conduct at-sea F-35C operations. 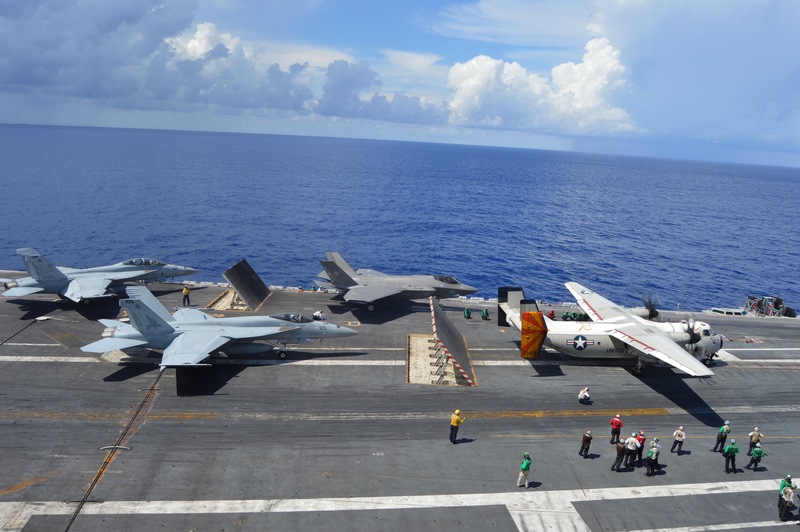 Though this event aboard Lincoln represented a significant step forward for fielding the F-35Cs, the ship would still have only been launching and trapping F-35s during each cycle for the safety of the pilots involved. The ongoing integrated air wing operations are unique in that they force the flight deck crew, the leaders in primary flight control, the maintenance teams in the hangar and more to balance the needs of all aircraft types together, throwing the Joint Strike Fighter into that mix for the first time.